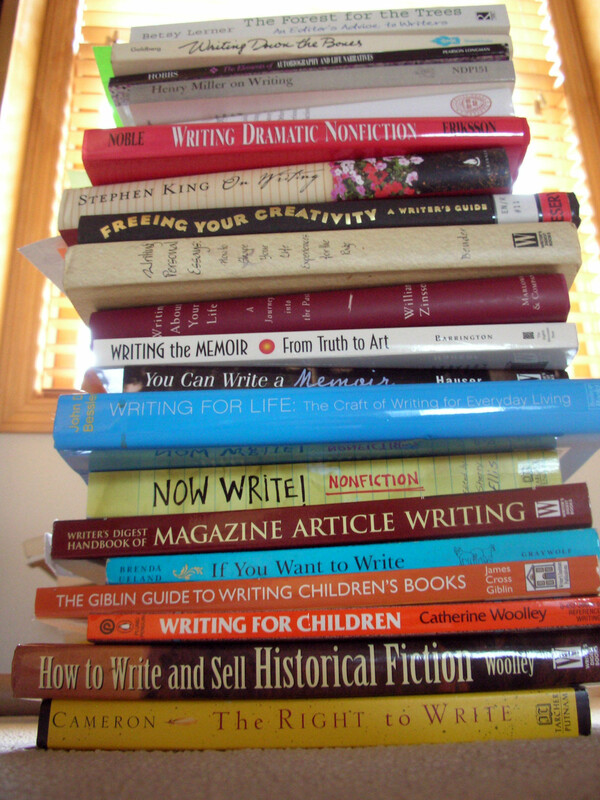 This is what too many “how to write” books looks like. This is from my personal collection. See below. On October 24, my good friend Angie Johnson and I presented some writing tips to a group of English and communications students at Bethany Lutheran College in Mankato, Minn. Angie teaches at Bethany, so does her husband, Lars, and I spent three semesters teaching there a few years ago. Here’s what Angie and I came up with for tips. Let me know what you think! – Proofread everything! Have friends/family look over your job search materials. Make sure names are spelled correctly! – It’s hard to say “no” to employers, because you never know when they’re going to contact you again. However, but you’ve got to know your limits. – If you put everything into your writing life, you’ll lose it (Rachael is a runner and snowbird; Angie is an official Kid Cheerleader and jealous of Rachael who is a snowbird). – Keep negative people out of your light. If you’re a negative person, fix it. Or don’t. Maybe you’re the next Cormac McCarthy. – Writing should not come at the expense of relationships. Know your priorities. Read and most importantly (drum roll)… WRITE. – Write. Sit your tookis in the chair and write. No excuses. No theorizing. Write. Theorize later (ahem… Lars). Live by the Nike slogan: Just Do It. Great advice, wise one! And I know…there comes a time when telling yourself that you’re getting something done by reading books on writing is really just NOT writing. These books are good for occasional inspiration, but there was a point where I was reading them a lot! Almost to the exclusion of doing my own writing. Big mistake! I got stuck in the read-about-writing stage for at least 8 weeks, and at the end of each day I just felt frustrated that I hadn’t written a single thing! Now I go back to my favorite how-to books when I need a kick in the pants or I feel stuck, but I don’t let them fill up my writing time. Well, I try not to, but Bird by Bird and Writing Down the Bones are so good! I can’t believe I forgot to put Bird by Bird in that photo! I really treasure that book. It is one of the best ones out there on writing. Great advice here. My own stack of how-to books fills most of 30-inch by five-foot bookcase! Embarrassing, especially since just a few great ones move me, and they are buried in the ones that don’t. Trouble is, like any reading, the ones that do it for you . . . you have to find! Richard, what “how-to-” write books are your favorites? I like Stephen King’s ON WRITING. I think William Zinsser’s books are classics. But I don’t think any book has “made” me a writer. That only came about by actually sitting down and writing. All are very good tips. I would add: aspiring writers might ask themselves whether they LOVE to read and write, or do they like the idea of being able to say “I’ve been published?” Of course, we all want the affirmation of being published, but it’s the love of the craft that has kept me going. It’s hard work, and if I didn’t love it, there’s really would not enough incentive to do it. The pay and the recognition are pretty paltry compared to the work involved; but the process, learning, growing, writing (or reading) something that “clicks” or that surprises me or enlightens me or makes me feel connected to other people, those are the real rewards. I agree! I like coming up with something new when I write. I enjoy working with words. Finding just the right word gives me a lot of satisfaction. I discovered a long time ago that I write in order to make sense of the world around me. I think back to high school with all of its conflicting emotions and the journal that I kept during that time. If I hadn’t written things down, I probably would have gone crazy. It’s like I don’t really know what to think or how to feel until I get a chance to analyze it on paper. For this reason I would always write. I wouldn’t want that type of highly personal writing to get published, anyway.